In London, 1876, tiny baby Hetty Feather is abandoned at the Foundling Hospital. She is sent to live in the countryside with two foster-brothers, Jem and Gideon, helping in the fields and playing imaginary games. Together the three sneak off to the travelling circus, where Hetty is mesmerized by the show – especially by Madame Adeline and her performing horses! Hetty’s happiness is threatened when she is returned to the Foundling Hospital. The life of awful uniforms and horrid food is a real struggle. But now Hetty finally has the chance to track down her missing mother. Could she really be the wonderful Madame Adeline? Or will the truth be even more surprising? A heart-tugging story of secrets and surprises from the blockbusting Jacqueline Wilson, introducing a feisty heroine who lives in historical times. i think it is the most touching story that just breaks your heart but if wish i was there at the time. I LOVE IT!!! This book is brilliant. This book it is full of emotions sometimes your sad sometimes your angry and sometimes your face is lit by a smile. This heart tugging book is full of secrets and lies.i have read the whole collection in a month simply because it was to good to put down. However the question that was whizzing in my mind will Hetty Feather ever get the freedom she wants? I think this book is interesting because Hetty Feather is a naughty and brave girl even though she can’t stand the foundling hospital she still is brave. An awesome book this is the only book I have read from the trilogy. But it truly is surprising when she finds out that ….......... Is her mother. (I don’t want to spoil it for people who haven’t read it or are still reading it.) a book full of adventure,wonder and misery. Pls. Don’t forget to see my page!!! I’ve read Sapphire Battersea and Emerald Star and know I’ve read Hetty Feather! It is a amazing book! Jacky’s best story ever. 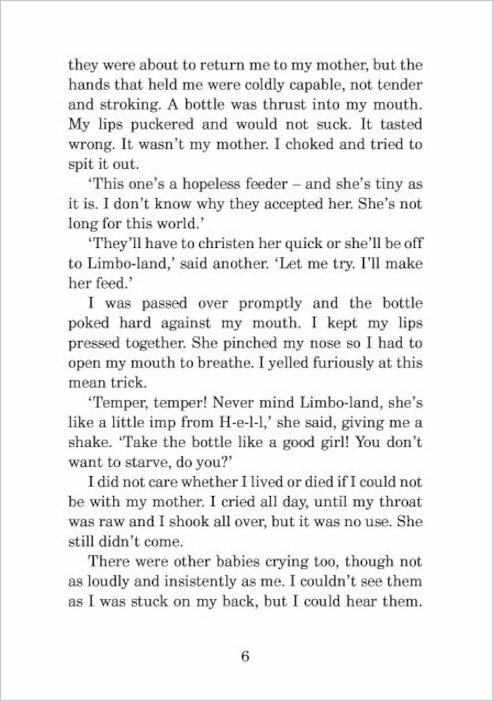 It shows the harsh reality of foundling girls with a mix of adventure/fantasy. Hetty is such wonderful character. I hope she meets Bertie again. My favorite out of the triolgy is probably Sapphire Battersea. I can imagine what happened to hetty feather. Her getting locked up in the room and so much more.I have to rate it 5 stars! Really good Hetty feather is so brave. This is the first instalment in the series! the first few chapters are dull but after that i couldnt put the book down! 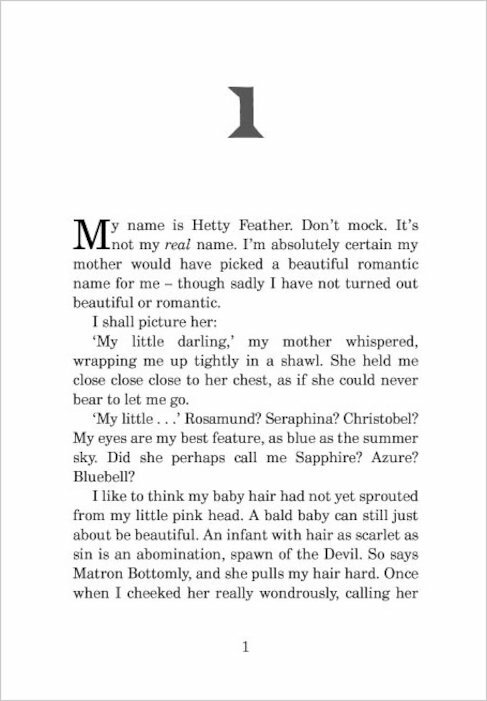 cant wait to read sapphire battersea! I love this book by Jacqueline Wilson!! I have read all 3 of the hetty feather series (emerald star, hetty feather and sapphire battersea) and I have loved every single me of them, I would say that hetty feather and sapphire battersea were the best so if you want to read hetty feather, I would recommend reading all 3 of them because then you get a real understanding of all the characters and most of all hetty. Hetty changes her personality quite a lot in every book, from naughty, to independent, to grown up and lady-like! This book is astonishing a sad and happy parts for all readers of any age and any gender. Go and try it out tell me what ya think. After hetty feather is sapphire battersea another brilliant tale of hetty feather by the worldwide author….... JACQUELINE WILSON! I JUST LOVED THIS BOOK! 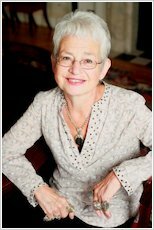 Jacqueline Wilson is my favourite author as she always can make the reader feel like the main character. The Hetty Feather series is my favourite! I just haven’t read “Emerald Star” but I’m sure it will be as good as the others. This is such an amazing book!It’s quite a sad beginning but everything goes right at the end!You must read Sapphire Battersea next though!! !Loved it! 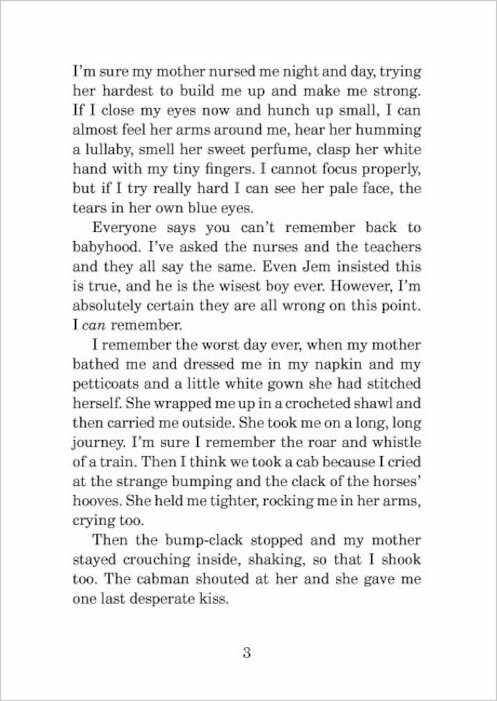 This book will bring tears to your eyes and is sutable for children about ages 9+. Keep a few spare tissues beside you as you are bound to cry with sadness and laughter as you read about Hetty’s life. This is the first in the trilogy about hetty feather in the foundling hospital. 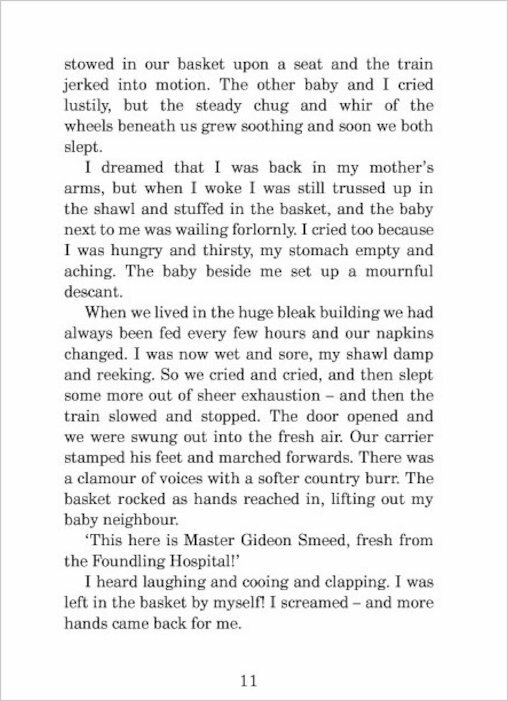 Hetty is left at the foundling hospital when she is only a baby. As she grows up, she longs to find out about her real mother. 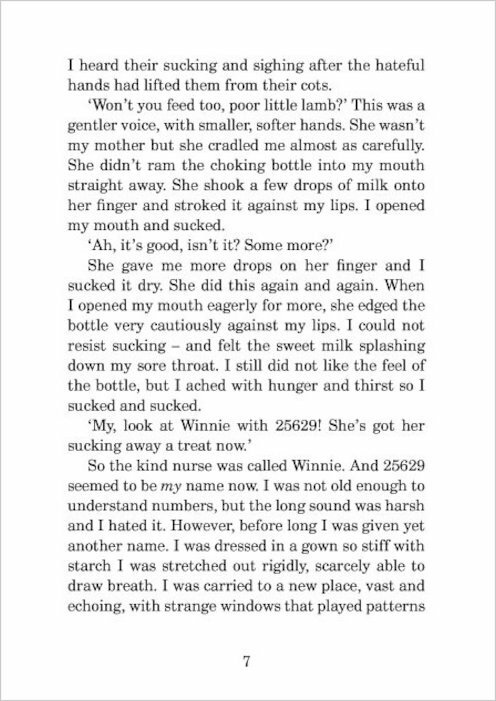 This is the story of how Hetty finds her true mother. I’d recommend to anyone who loves a good book. A WONDERFUL BOOK. Hetty is brave, fierce and determined. I wish i could be like her. it is a about a girl who was abbandoned at the founling hostipal she is sent to live in the countryside with tow foster brothers jem and gideon….. This book is really good I loooooove hetty feather. It’s a really gripping and entrancing story. Definitely a book you should try! i love this book i also love sapphire battersea and am waiting to read the third one, emrald star! So far i think its abosoulotley amazing!!!!! This an exellent book about a girl in the 1800’s and gets dumped at a foundling hospital. She is given a silly name; Hetty Feather. She is adopted my a family. Then when she turns 5 she is sent back to the foundling hospital to be trained as a servent! A great story very touching. One of her best stories so far! i loved it this is an amazing book i couldnt stop reading it !! I liked this book very much, and when i found out saphire battersea was out, I read it straight away! There’s supposed to be a third one, but I don’t think it’s out yet! * * * *! Hetty Feather is a really good book and it has a good stucter. When you are reading this book it is hard to put it down. I would reccomend this book to anybody-boy or girl. This is the best book ever I loved it. Hetty Feather is a fab book about a Victorian ‘orphan’, who lives in a big school/orphanage. It tells of her hardships and how she gets her own way in life! Wow, this book was excellent! As I have also read the second one it makes it seem like such a good book. Hetty is a funny character and makes us laugh and cry at times in the book. Read it! Hetty Feather is a very nice book. Its very adventurous. I don’t like adventurous books but Hetty Feather impressed me! this book is amazing it has extrodinary detail and is very intresting. for me this is one of wilsons best books. This book is my favorite book! i loved it, it was such a good book i even felt like i was Hetty! i had some tears like when Hetty left her Mama but i felt like i was going through Thick and thin with hetty, every single minute. Wow jacky this is AMAZING !!! it’s my BEST BOOK EVER !!!! wow! great book! btw, emerald star is coming out soon!!!!!!!! At my school we have a cosmic diary which mean we have to read:5 books for bronze;10 books for silver, 15 for gold and 25 for cosmic reader. Though you have to do tasks along the way. You might have to read a poetry book, make a poster, re-design a front cover and a whole lot of other things. I read this for my historical book. It was great because it wasn’t to last century! This is probably my favourite book. 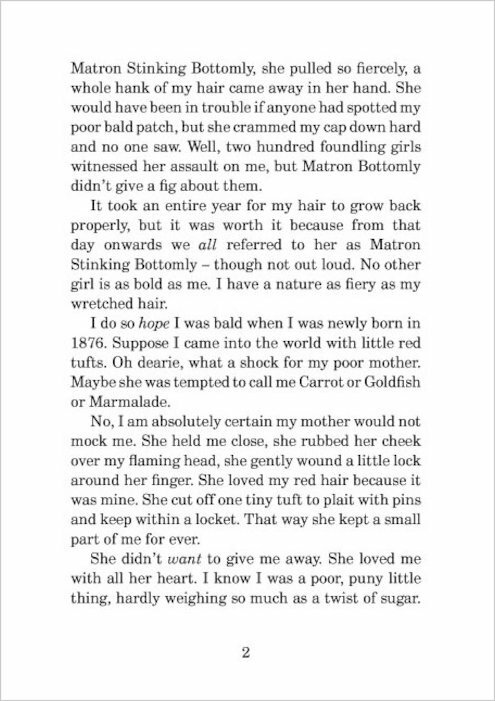 It is about Hetty, a Victorian Foundling who is feisty, cheeky and clever. She is on a quest to find her mum. Sad, funny and really enjoyable read it!!! I adore this book. I strongly identify with dear Hetty. I am often rather to loud for my own good. I rate this book 50 out of 5. * /* I love the characters, but a few little bits seem annoying. For example, it says that the only physical punishment the children had received was ‘a light slap on the back of the legs or an impatient tug on the ear’ in a time when most children were beaten with canes, switches, belts, straps etc. GOOD BOOK!!!! I loved this book as it made me feel like I really was in the foundling hospital. 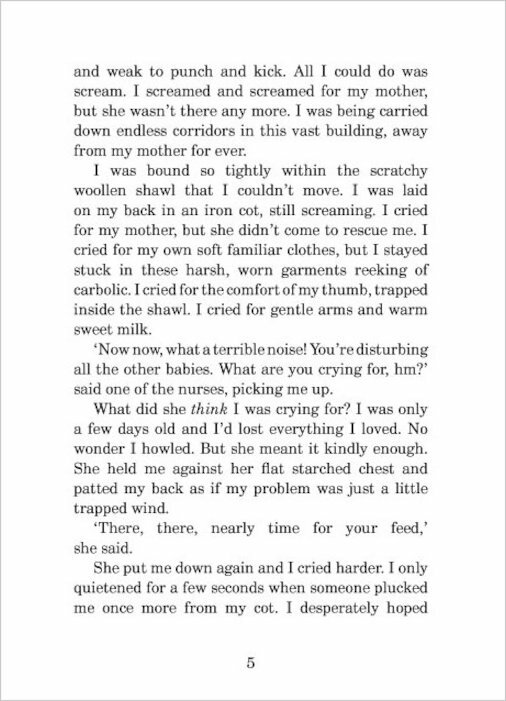 I felt the pain and heatbreak that poor Hetty felt and am now going to read it for thr third time! A fact and fiction book tell the story of an orphan in victorian times. Hetty was a weak baby. but she was soon given a loving home just to be brought back to were she started. I did not like hetty feather because most of the chapters were quite boring. But that is my opinion. You might like it. I really loved this book I just couldn’t put it down it was really interesting and it is my favourite book. I have actully met Jacqueline Wilson in the book festival! This book is a tidal wave of emotions, sometimes happy, sometimes sad, and I love Hetty and her picturing. I find the end quite funny, especially the last line, but I’ll leave you to find out that by yourself! this book is brilliant, i have read all of it. it’s sad, happy lots of different expressions. i would suggest over 8 year olds should read this book and they would love it. i really loved,loved this book. it’s really emotional when Hetty finds her real mum. all i can say is that i really liked this book. 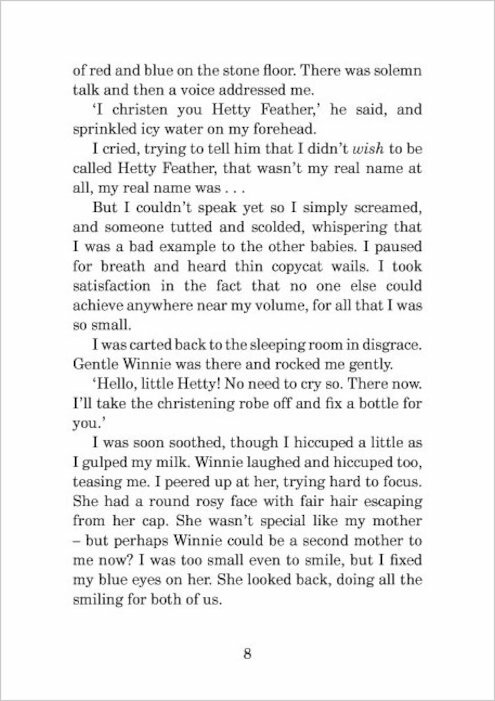 This is all about a Victorian girl named Hetty Feather. Hetty is an orphan so lives with a wet nurse for a while. 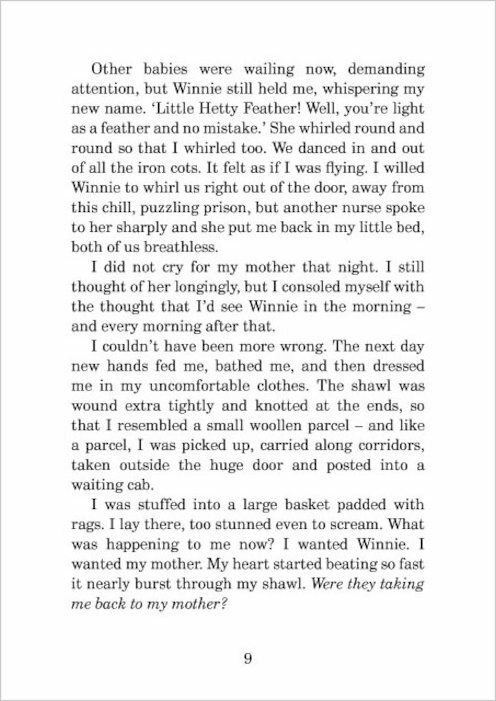 Then the story tells of Hetty’s tragic move to an orphanage with a horrid matron. Hetty has many adventures right through the book. I think this is my favourite Jaqueline Wilson book because the story is well written and VERY gripping! I would suggest this book to girls age 9+. It is a really good book, beacuse Hetty is really cheeky. We all want to know who hetty’s mother is and there are lots of people who could be the one. But we find out in the end. I love all of Jacqueline Wilsons books, I have read every singole one. I joined her fan club ages ago. My fav jacquline Wilson book is Candyfloss. 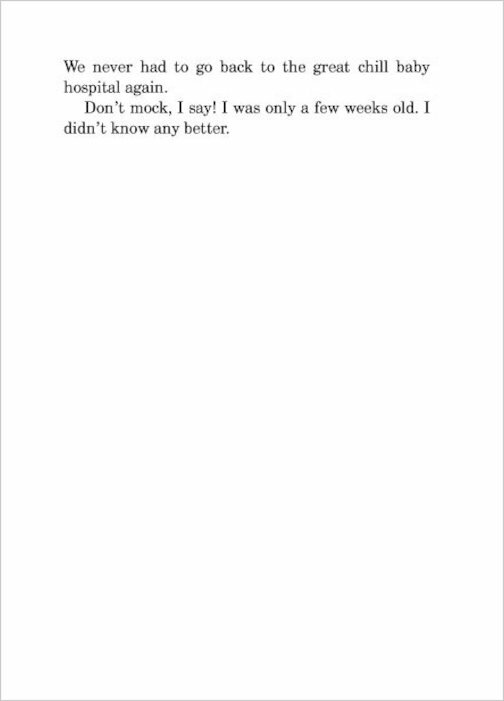 I cant rate this book but I am dyeing to read it. All my friends have and it is ment to be a fantastic, no, brilliant book! I havent read this book yet but im despret to read it my friend brought it to school and i wanted to steal it! like all of jaqueline wilsons books-boring, repetious and EXTREMELY dull! I got this book for Christmas and it is amazing! It is simply the best Jacqueline Wilson book ever! I actually finished it in three days! It is beautiful and emotional one of Jacqueline Wilsons best books.In some parts I nearly cryed because it was sad and what it would have actually happened two centurys ago in the victorian period. At parts I felt like i should of been jumping up and down. It was brilliant. This is definitely Jacqueline Wilson’s best book yet. Hetty Feather is the best book I have ever read! It tells you all about a life of a Victorian child and I learnt alot from it .Sometimes I stayed up really late reading it because I Couldn’t put it down.Once I had finished the book I couldn’t stop talking about it, I would recomend it for children aged 9 and above. Hetty feather is a great book and I loved it! 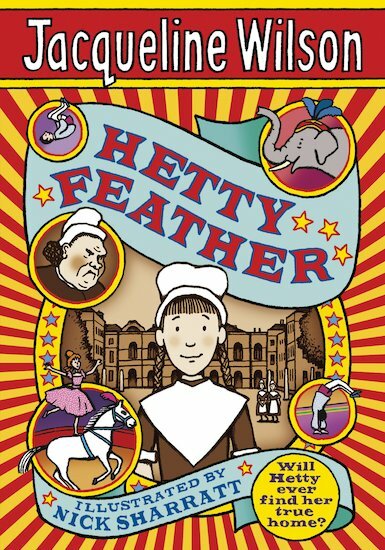 i absolutley loved Hetty Feather because it’s about the Victorians and i love the Victorians. if you want ot read this book you have to be one of them people who get into books really quick, because my friend said that she couldnt get into it. i got into it really quickly and thought it was the most superb book i have ever read. This book was very adventureful and funny at some places! 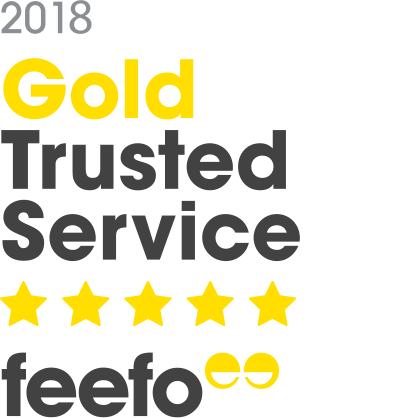 I would definitely recommend to other people!!! i thought it was a really good book. The storyline is amazing. I would recommend this book to anyone the age of ten to thirteen. Hetty Feather has everything you’d want in a book. Funny bits, scary bits, sad bits, imaginitive bits! It has over 300 pages, yet I read it in just three days! Plus, it is factual and historical which should keep your parents and teachers pleased! Now my mum wants to read it as well, so I think you should defintely buy it because my mum has great taste in books! It is in Victorian times as well, and I am doing a project on Victorians so it has been very useful from that point of view. 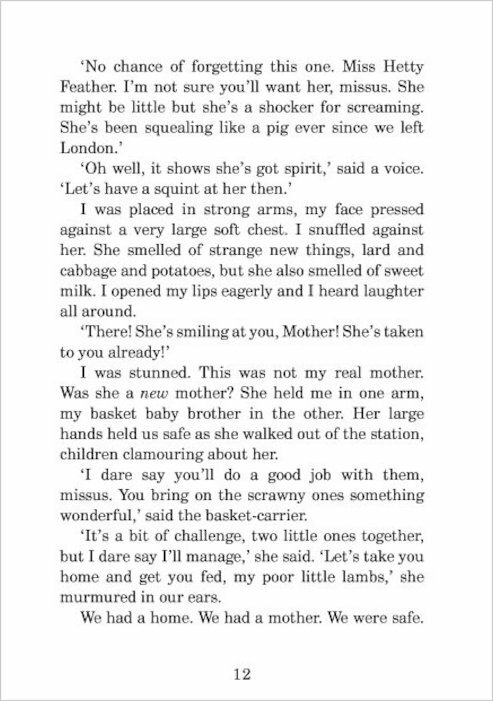 If you love Jacqueline’s books (like me), and wonder what it’s like to be abondened as a young baby in 1876-you should read it! THIS BOOK WAS COOL IT MAKES YOU FEEL DIFFERENT EMOTIONS THROUGH VARIOUS TIME THROUGH OUT THIS BOOK. YOU SHOULDER LAUGH GASP AND FEEL SAD ABOUT THE WHOLE PAST AND PRESENT LIFE OF HETTY. I RECOMEND THIS BOOK TO ALL PEOPLE WHO LOVE JACQULINE WILSON. I have just read this book sooooooo quickly i couldn’t put it down! 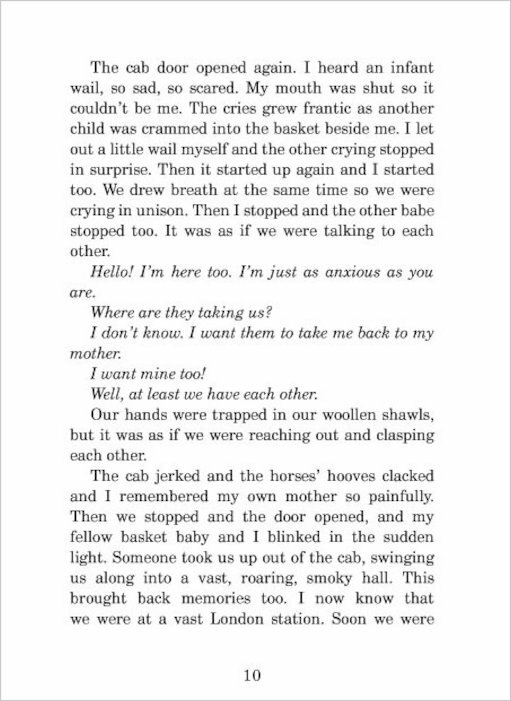 I love Jacqueline ilson’s books. She is such a good author! Canny wait to read this because she is my favourite author and I have read all o her books and I am her no. 1 fan!!! I have even met her!!! I won the competition to get a signed copy!!! I loved this book! It is a sad story but has a happy ending. It is Jacky’s best so far, I think.